Melina Markowitz, messenger for the underworld, delivers the goods for the supernatural beings in our midst—no questions asked. It’s more than a job; it’s a mission. Safety be damned. Melina’s missing friend, Paul, could just be taking a little werewolf “me time,” but her investigation yields something more sinister. Suspicions first fall on Paul’s wolf-pack rival. But that wouldn’t explain the sudden windstorms rattling Melina’s nerves—or the ominous, shrieking crows that keep appearing. The clues lead Melina to a mermaid, a damaged and possibly deranged police officer and patterns for Norwegian doilies—finally bringing her to the realization that she may be dealing with the most powerful enemy she has ever faced. 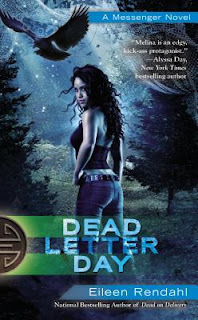 Dead Letter Day by Eileen Rendahl is the newest book in the Messenger series. As a messenger that specializes in delivering information and news to supernatural beings, Melina Markowitz has an interesting job description. She doesn’t get health insurance or a guaranteed vacation, but it’s never boring. After all, not many people can deliver such unique messages, and also say that they’re a ‘werewolf whisperer.’ Then she finds out that one of her friends, Paul, is missing. Usually a werewolf can just take some time for himself, but this time when she looks into things, it seems that his Pack can’t find him either. That means she has to get involved. There are the usual suspects, vampires, another werewolf pack, but there are other things that don’t sit right with Melina, and a murder of crows is a really bad sign no matter who’s involved. She follows the clues, and discovers a number of individuals with their own issues, all of whom are just leading up to an enemy that Melina isn’t prepared to deal with. But, she’s going to have to, if she wants to save her friend, and herself. The Messenger series has a number of supernatural creatures, and in this one there is a lot of information about werewolves, establishing right away that it takes a special kind of person to handle them. Other characters play crucial roles, and Melina has to deal with her emotions more than she might want to, all while figuring out what happened to Paul. Of course, this would be easier if Melina knew how to ask for help, but it seems that she’s learning. Overall, Melina handles things with an amusing narration, and sometimes has to bite her tongue so she doesn’t say the wrong thing, which is combined with her observations about werewolves, vampires, and anything else that crosses her path. For new readers, this isn’t the book to start with; and it’s a much more fun read if one already knows where Melina and her friends, and sort-of-friends are coming from. The conclusion leaves the story open for a lot more adventures, and it will be fun to see what sort of trouble Melina finds next.